I get lots of requests for slow cooker recipes so, with Autumn in full swing and winter on its way, I thought it was about time I got another on the go. I love a good ragu….rich, meaty and divine smelling, it makes the most wonderful dinner when added to a good pasta. 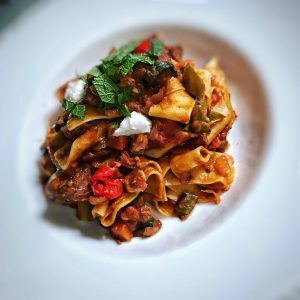 This week, having spotted some extra lean diced lamb in Sainsbury’s, I thought I would create a nice healthy lamb ragu dish. I add some goat’s cheese at the end for a creamy, indulgent twist however if you want to keep the points lower you can omit the goat’s cheese and it would be 10sp per serving. Alternatively you can replace it with 120g light feta cheese and the dish would remain 12sp. It may seem a bit strange to sprinkle the dish with mint at the end, and don’t worry too much if you don’t have any but it does add the most lovely fresh end to the dish. And who doesn’t love a good lamb and mint combo!! Take a large saucepan, spray with 1kal and add the onions, garlic, pepper and carrot, frying on a medium heat until they start to soften (around 10 minutes – add a little water if the pan gets too dry). Remove the veggies from the pan and pop onto a plate to one side. Next, spray the pan with a little more 1kal and then add the diced lamb with the cumin, cinnamon and oregano and fry the lamb until browned (this should take 10-12 minutes). Add the veggies back to the pan and then add the wine and simmer for another few minutes (until the alcohol has burned off and the liquid has almost evaporated). Add the tomato puree, stir and simmer for another 2 minutes and then add the chopped tomatoes, Worcestershire sauce, stock, bay leaf and crushed chillies. pop in the slow cooker on high for 4 hours or low for 8 hours. Cook the pasta for the last ten minutes of the lamb simmering. Once the lamb is nice and soft and the sauce is reduced, remove the bay leaf from the pan and throw in the spinach. Let it wilt for a few minutes. Drain the pasta and toss through the sauce. Top with the roughly torn goats cheese and a sprinkle of mint leaves. Just made this for tea tonight was super tasty! Can’t wait to have the rest tomorrow mmmm! Pleased everyone liked it Christine! Glad you liked it Carol!!! I don’t like lamb, so could I make this with beef?